Teammates hold hands as they prepare for the cold water at the Special Olympics' Penguin Plunge at Jennings Beach on Saturday, April 6, 2019, in Fairfield, Conn.
FAIRFIELD — Warm hearts met cold water when over 100 caring fundraisers took the Penguin Plunge on Saturday morning at Jennings Beach to benefit the Special Olympics. 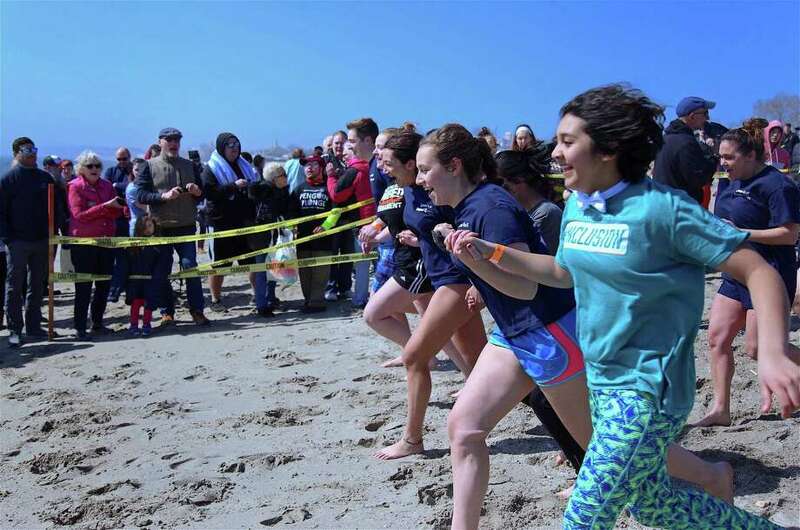 Each swimmer brave enough to go under water that cold morning earned $100 for the nonprofit. People came in costumes, dressed as penguins, superheroes, and even members of the alterantive rock group Devo. But once the whistle blew, most people shed their costumes for swimwear and headed down the beach to feel what 40-degree water feels like in the first week of April.